You finally get a new 4K TV, and get ready to enjoy your videos on it with crisp, sharp image and Hi-Fi audio. You know, 4K video has a higher quality than 720p, up to 9 times as many pixels as a 720p display and 4 times as many pixels as a Full HD 1080p display. But what a depression that you find your 720p/1080p HD videos cannot be played perfectly on your 4K TVs! Never mind. There is something you can do to make 720p videos available on 4K TVs - convert 720p to 4K videos. And all you need is just a 720p to 4K video converter, which can be used to upscale 720p/1080p to 4k (3840×2160 or 4096×2304) with enhanced picture quality for viewing on 4K Ultra HD TVs or fit for other uses. Convert videos from lower resolution to 4K UHD, like 720p to 4K, or 1080p to 4K. This is absolutely a good news for those requires a lot on video quality. Transcode any format to format with 370+ video audio codecs built in, like convert HEVC to H.264, H.264 to HEVC/H.265, VP9 to HEVC, MKV to MP4 etc. Compress UHD 4K video to lower resolution and smaller size, be it compress 4K UHD to 1080p, 1080p to 720p, 720p to 480p/360p etc. Speed up the video conversion and enhance the video quality, thanks to the multi-core CPU processing, hardware acceleration, high-quality engine and the HT tech. Generally, this program runs 5X faster than its competitors with 98% quality reserved. Edit SD HD UHD videos as you like - trim/crop/split/merge, add watermark, add srt subtitles. It's ease-to-use and it's both available on Mac and Windows platform (The latest macOS High Sierra and Windows 10 are supported). At the very beginning, you need free download the program according to your computer operating system. Step 1: Load 720p files. Run the up-conversion 720p to 4K converter and click + Video, select a source 720p HD video or multiple videos, then the 4K converter will load the 720p source immediately. As most 4K UHD files are encoded with HEVC/H.264 codec for playback on 4K TVs or 4K video players, you're highly suggested to choose General Profiles > 4K MP4 Video > Done or PC General Video > HEVC Video > Done from the automatically popped up window. If you have no idea about which format to convert to, you can take 4K TV supported formats as a reference. Tips: If you choose 4K MP4 Video, you don't have to adjust the parameters manually. The output video was automatically set to H.264+aac codec, 3840×2160 resolution, which is superior than other 4K video converters. Step 3: Upscale 720p to 4K. Click on the on the main interface. Select 3840×2160, 4096×2160 from the drop-down resolution window, so that you'll be able to upscale your 720p HD content to 4K resolution. Step 4: Start the video upconverting process. After the settings done, optionally you can click Browse button to specify a destination folder to save the converted 4K videos. Then hit the RUN icon to start upscaling 720p to 4K UHD. And finally you're able to play 4K on VLC, 4K media players or 4K TVs as you like with optimal quality. BTW, the same steps go for converting 720p to 1080p, 1080p to 4K and more. This HD video converter also enables you to customize and edit your videos as well. No matter you wanna adjust Bit rate to downscale 4K video file size; tweak frame rate to improve 4K video quality after conversion, change aspect ratio (4:3 to 16:9), cut off the unwanted part of videos, add subtitles or watermark to 4K video, etc., this 4K converter for TV will do the trick. 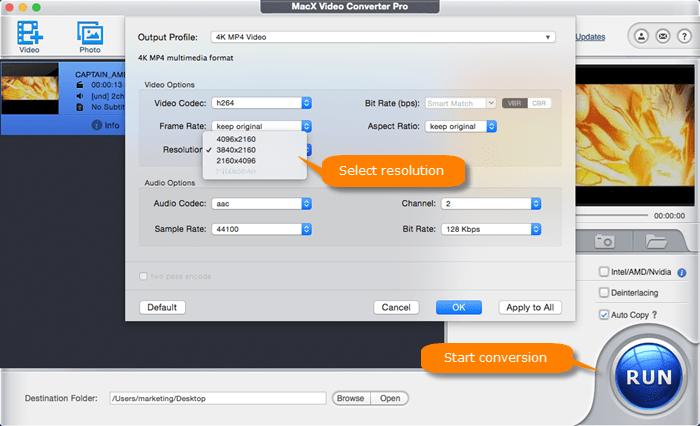 MacX Video Converter Pro can quickly upconvert HD to 4K for 4K UHD TVs and downscale 4K to 2K, 1080P, 720P for non-4K TVs with sharp image quality. 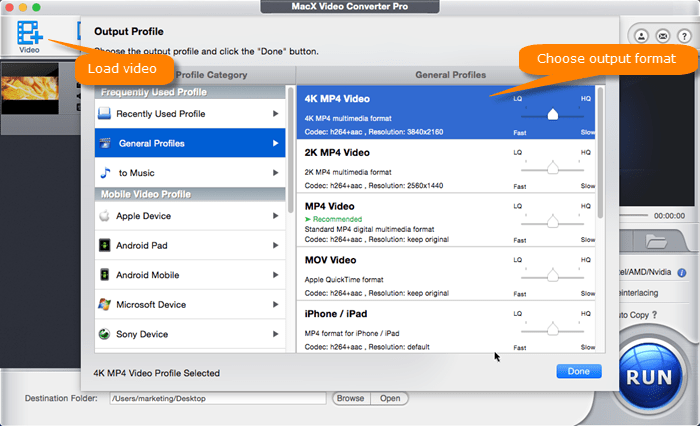 Also convert among video formats, HEVC to H.264, VP8 to VP9, H.264 to H.265, MKV to MP4 etc. Best 4K TVs for Gaming/Movies from Samsung, Sony, LG etc. How Can I Play 4K on Macbook without Any Trouble? Where to Find 4K Content?